Based in Warsaw, Poland, RoninSearch now partner Wave Search to support the expansion of key clients across Europe. The founder of RoninSearch, Cal Doherty has over a decades worth of experience in European wide search across Management Consulting, Financial Services, M&A, Corporate Finance and Technology. Wave Search are now proud members of the Recruitment & Employment Confederation (REC). REC is the leading professional body for recruitment in the UK. Our membership and adherence to the REC Code of Practice illustrates our dedication to provide our clients and candidates with the highest quality service. Wave Search passed the REC Compliance Test with a score of 97%. Wave Search are proud to support The Clifftop Challenge. In 2018 they raised a huge £38,000 for Breast Cancer Now! All money raised is donated to this fantastic charity and in the past 5 years has raised over £100,000! 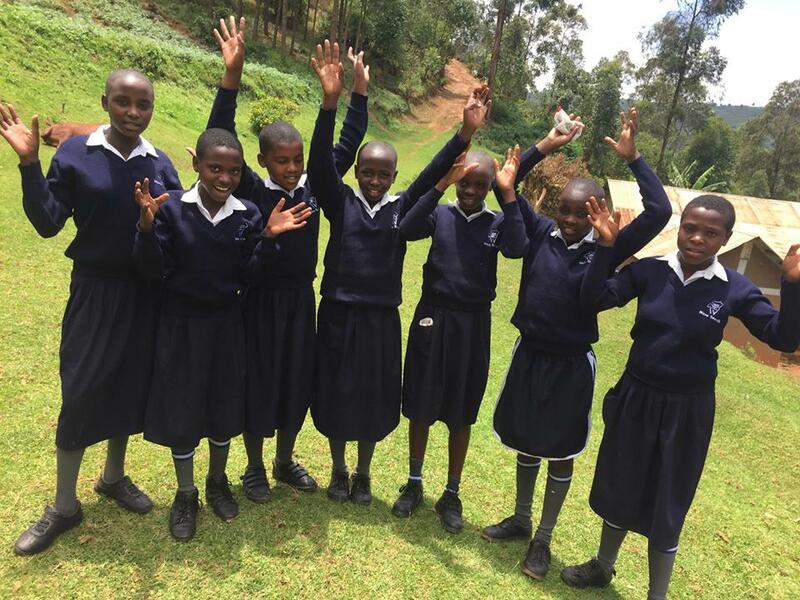 WAVE SEARCH are proud to have supported The Abode Project in Western Uganda by donating funds to purchase 90 new school uniforms for their students & orphans. The Abode Project Preparatory School was setup in 2016 by Kai Cant, a friend and founder of Abode. He used profits from his highly successful dance music business and crowdfunding to buy the land, build the school and fund all running costs including teachers, equipment etc. The school and orphanage now supports 90 - 100 local children and provides them with a safe environment and opportunity to have an education and bright future. In just 3 years, Abode have become a global brand in the dance music scene, organising events and playing to 1000's of people across Europe with residencies in London and Ibiza. They also run festivals, a record label and now manage some of the worlds hottest DJ's. What inspired you to set up Wave Search? The name Wave was inspired by the 2004 Asian Tsunami which thankfully, despite being washed away in the waves, my wife and I survived whilst travelling through Thailand. It was a genuinely life changing event and when we formed the company, Wave seemed like a fitting name and tribute. After returning from Asia, I spent over eight years working in London for an international recruitment firm as Head of Technology and finally UK General Manager. I always had ambitions to run my own business, so in 2015, when I visited Discovery Park in Sandwich, I sensed a real opportunity to build a recruitment business on the Kent coast that could still support clients and candidates globally. It’s really done well in 18 months – what do you think were the key factors to its success? Timing has been key and despite Brexit and an uncertain political and economic outlook, Wave entered the market at the right time as our areas of specialism such as Digital and Fintech have seen significant growth over the past 18 months. Our talent pool in these niches has become increasingly attractive to consultancies and corporates embarking on major Digital Transformation initiatives. This has enabled us to forge strong recruitment partnerships with several global, multi-billion dollar organisations including AON, KPMG, Tata, Cognizant, First Data and Nationwide. Our aim for the first two years of trading was to build a world class client portfolio and Wave’s reputation in the market. What has really helped take the business to the next level has been collaborating with a network of trusted associates and industry SME’s which has given Wave broader candidate networks in key technology areas like Digital, Big Data, Cloud and Payments. As a start-up, this collaborative model has given us scale and has vastly improved our capability to deliver our clients demand. Why has Discovery Park been a key role Wave Search’s’ success to date? When I decided to set up Wave, it was important to find a corporate but friendly environment that was well connected to London. Discovery Park is a Government Enterprise Zone and offers a highly professional environment, fantastic facilities and the option to scale up or down when your business needs it. The ‘Start Up Zone’ was a great place to kick the business off as it was created exclusively to support new businesses in the region. Discovery Park has played an instrumental part in Wave’s journey so far and we are dedicated to building the business and team onsite in the coming years. It’s been quite a year for Digital, Consulting and Fintech industry recruiters Wave Search – with the choice of Discovery Park as its office base playing a key role in its success to date. Over the past 12 months the business has transformed from a small recruitment start-up to becoming strategic recruitment partners for several global, multi-billion dollar organisations including KPMG, AON, Tata, Cognizant and Nationwide Building Society. The company was formed in June 2015 by Gareth Jones, after he spent nine years working in the capital for an international recruitment firm. “I was living in Deal and commuting to London daily,” explained Gareth. “There are great facilities at the park,” Gareth continued. “There’s a certain level of professionalism here at Discovery Park that was difficult to find in other offices and business hubs locally. “Setting up a new business can be a daunting task but the support from the Discovery Park team was great and the opportunity to build business relationships and collaborate with other small businesses onsite has been fantastic. Reflecting back on the launch of the business, Gareth said: “Wave Search began life in the Start Up Zone, it was ideal for us and the other businesses still in their early stages. “Everyone’s business ventures were at a similar stage, there was pleasant community feel, so it really felt like the right place for us at the time. One of the great things about Discovery Park is the option to scale up or down when your business needs it. With two full time employees currently working for the business and more planned for Q2 2017, Wave has an innovative business model whereby they work with an associate network of small recruitment firms and independents that support delivery into Wave’s impressive client portfolio. Gareth explains: “In terms of FTE’s, our expansion during our time at Discovery Park hasn’t been significant, but in that time, we have built a stellar client portfolio. We have also built a network of trusted associates and industry experts that give Wave subject matter expertise and broad candidate networks in areas like Digital, Big Data, Cloud, EA, FinTech and Management Consulting. “As a start-up, these collaborations have really helped take the business to the next level and vastly improve our capability to deliver our clients demand. “Our focus for the first two years has been building a sustainable and profitable business, our reputation in the market and expanding our client portfolio. “We are now at the point where we need to upscale and build a strong delivery team to support our clients. “Our expertise is building digital and business transformation teams and over last 18 months, we have been working on several key client projects. “We built a brand new Data Management team for a retail bank. This was a hugely interesting project as the team went on to build the banks mobile application that is now commercially available to all customers. “We are currently engaged on a very exciting volume assignment with a major IT services where we are building several senior teams in Big Data, Digital & Mobile Banking and Agile Consulting. Wave Search has an exciting pipeline for the rest of the year and ambitions to grow the core team. Gareth explains: “Since Q3 2016, we have seen a spike in client appetite and a subsequent increase in revenue. We have worked hard to build a strong pipeline for 2017 and have set some ambitious targets for the rest of the year. “These are based around maintaining current key clients, expanding our client base in our chosen niches and growing the core team. Gareth concludes: “It’s incredible to see how Wave Search has evolved during our time at Discovery Park.